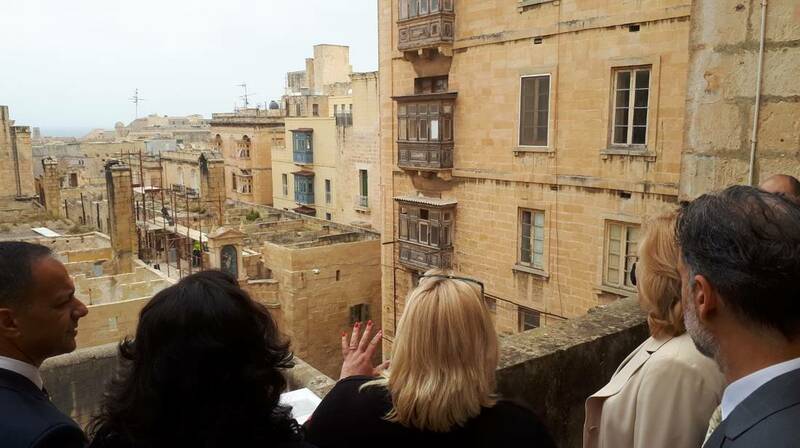 During the Valletta Design Cluster visit. Commissioner Corina Cretu and Commissioner Karmenu Vella, together with Minister for European Affairs and Equality Helena Dalli, Parliamentary Secretary for EU Funds and Social Dialogue Aaron Farrugia, Valletta 2018 Chairman Jason Micallef, and their respective delegations, visited the Valletta Design Cluster this morning. The Valletta Design Cluster, which is also one of the Valletta 2018 Foundation’s flagship infrastructural projects, shall transform the abandoned Old Abattoir site (Il-Biċċerija l-Antika) in Valletta into a hub for community and economic development. The Cluster shall serve primarily as a community space for cultural and creative practices, by providing space and support for students, individuals, freelancers and independent creative practices and organisations, and by networking internationally with other creative hubs, design centres and urban regeneration projects. The project, which is currently underway, is being funded under the Sustainable Urban Development strand of the European Regional Development Fund (ERDF). Such projects are aimed at improving the urban environment in the Harbour area for stronger and sustainable neighbourhoods, while also fostering an environment which is conducive to economic activity. The Commissioners’ visit highlights the importance of joining economic with social and cultural investments to ensure opportunities in these areas are of benefit to all sectors of society. While major infrastructural investments in the past have focused on centrally-located high profile sites within Valletta and the Grand Harbour, the Valletta Design Cluster is located within a residential area which has suffered from decades of neglect and lack of basic infrastructural upgrades. The aim of the project is to provide a better living environment for Valletta residents, open up new opportunities for bottom-up innovation initiatives, and support new career openings for young creatives. Valletta 2018 Chairman Jason Micallef called this visit a strong demonstration of encouragement by the European Commission in ensuring that the benefits of the European Capital of Culture in Valletta are built on a long-term vision that will benefit both the Valletta residents and the Maltese creative community for years to come. The Valletta Design Cluster, which aims to open its doors to the public in mid-2019, will house a range of studio spaces for cultural and creative practitioners, a maker-space with specialised technology for shared use, a number of meeting rooms and conference facilities, a food space, as well as facilities for artists-in-residence. It will also have a new fully-accessible public garden on its roof, which is a first of its kind initiative in terms of greening the roof spaces of public buildings in Valletta and making them fully accessible to the general public.